Exploring heat pump water heaters for efficient water heating. Check out different types, advantages, disadvantages, tips on how to select, and the most popular brands. Sometimes finding ways to combine your HVAC appliances not only makes sense from a financial standpoint, but it also makes good sense environmentally. Combining your heat pump with your water heater helps with everything while cooling your house by diverting heat from indoors to your water heater, heating your water without drawing any extra energy. 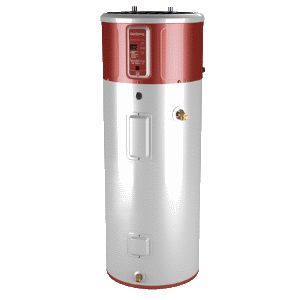 A heat pump water heater works by transferring heat from the surrounding air to the water heater as opposed to drawing energy from gas or electricity and heating the water that way. When you compare them to a traditional electric water heater, they are as much as three times more energy efficient and can still use the electric heating elements as found on the electric units. Those models that combine electric and heat pump technology are also called hybrid – Voltex from AO Smith, Rheem or GeoSpring are good example. Water heaters typically rank right behind the furnace and air conditioner or heat pump as your biggest energy draw, so savings should be priority. As you have probably noticed, most of the water heaters today are either gas or electric-powered which can get maximum of 99% energy efficiency. Heat pump water heaters on the other side are ultra-efficient that contribute much more in environment protection than mentioned above. Two types of heat pump water heaters are available; air-source which is more affordable and geothermal which is more efficient, but cost more money due to its uniqueness and complexity. An air source one takes heat from the air, compresses it, and uses it in a tank to heat up the water. You can buy them as a standalone, an add-on to your HVAC system and use it with a water tank, or you can buy a kit to make a heat pump adapt to a regular water heater. This means you have a cooler home and hot water when you need it. Additionally, you won’t be adding heat back to your house by another energy source being used on your water heater, and your humidity level will be lower. If you go with the air-source heat pump water heater, you can get the maximum of its efficiency if installing it the garage or technical room, where the furnace, for example, is installed, so it can take advantage of the emitted heat. Geothermal heat pumps, on the other hand, take heat out of the ground or groundwater and use it for heating the space, also domestic water. This gives you the ability to use your heat pump water heater longer during the year, because it does not depend on the outside air temperature for operation. They use a loop of coils or pipes that transfer water through them that heats up as it goes. Some geothermal heat pumps come with a desuperheater that is a heat exchanger using heat from the compressor to heat the water, which is then fed into the main water tank. They can be tankless, which is great in situations where the room space is restricted. If you live in a warm enough area, they can actually keep your water hot all season long without any boosters. If looking for the heat pump water heater price that will include the unit and the installation cost, you can expect somewhere between $1000 and $10000 or more (roughly), and the price depends on the heat pump manufacturer and contractor labor cost. Lower price range is for air-to-air type and for economy models. An air-to-air heat pump water heater is not that expensive, and it also gives you an instant return on investment, saving you as much as half on your water heating costs, depending on how much hot water you use. Plus, you don’t draw as much power off the grid, thus reducing dependence on energy sources. The heat pumps, which are very efficient, are also insulated pretty well to retain the heat longer. Almost every advanced model is equipped with the digital controller that allows easy control, monitoring and troubleshooting. Similar to an electric type, heat pumps are easy to install, service and maintain. One drawback to an air source heat pump water heater is that it tends to be effective only when it is warm. If you live in an area where winters are harsher, you won’t be able to use it during the winter as efficient as if you live in warmer. You also need to give it a chance to recover between uses, so many people using it in the morning can mean that some later users will have less than toasty hot water. While you may save money in the long run, installing a geothermal heat pump is expensive, more so than an air source one costs, and it requires a specialist to install it. You will want to consider your current system and evaluate where you will place your new heat pump water heater, and how quickly you could start realizing a return on investment. Evaluating where you place your HVAC device is important because it will be critical to maintain a good external environment. There should be good air circulation and a temperature that does not drop below 40 degrees. You should also site your heat pump water heater in places that can help dampen the noise, so you don’t have a lot of sound coming into your house. The piping you choose can also help reduce operating noise, so look to PVC piping instead of metal. Because of their size, they can be quite tall and they need a large space to operate. Some of the best models of heat pump water heaters include models from the originator of the concept, Rheem. Rheem heat pumps are not the quietest ones, coming in around 70 decibels, but can hold as much as 80 gallons of water. These units can switch to operate as electric water heaters when the outdoor temperature starts to drop, so you have a hybrid heating system without any modifications. Another good model is the AO Smith Voltex PHPT-80. This one has a huge 80 gallon tank so it’s ideal for overcoming those cold showers that smaller models might leave you with. Plus, it comes with extra heaters to boost the temperature if needed. It’s quieter than the Rheem, but that electric booster heater does mean it draws more power than other models will, so the energy efficiency is not as good. You can also consider the GE GeoSpring. It has a smaller tank, 50 gallons, but it is one of the most efficient at maintaining a good temperature level for everyone. If needed, it has two heating elements that will boost the heat level. It’s also a quiet unit, at only 55 decibels, and it is one of the least expensive models available. So if you are in the market for a revolutionary way to provide heating for your water and cooling for your home, consider a heat pump water heater. It can be a unique component of your HVAC system that helps reduce energy usage over time.